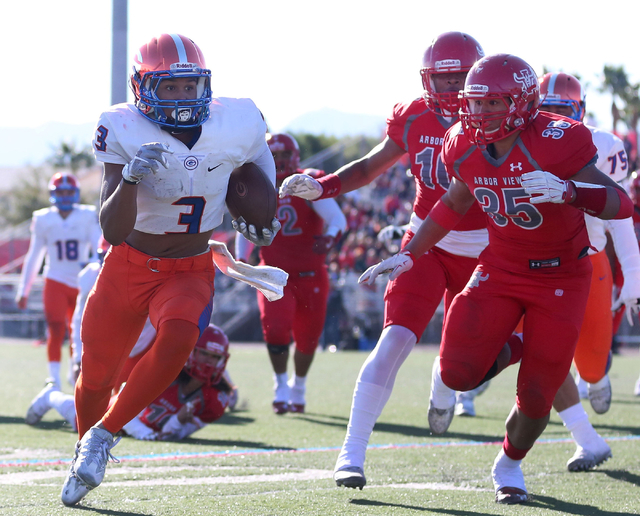 Here is the #NVprepsfb list of Southern Nevada’s top five wide receiver/pass catchers. 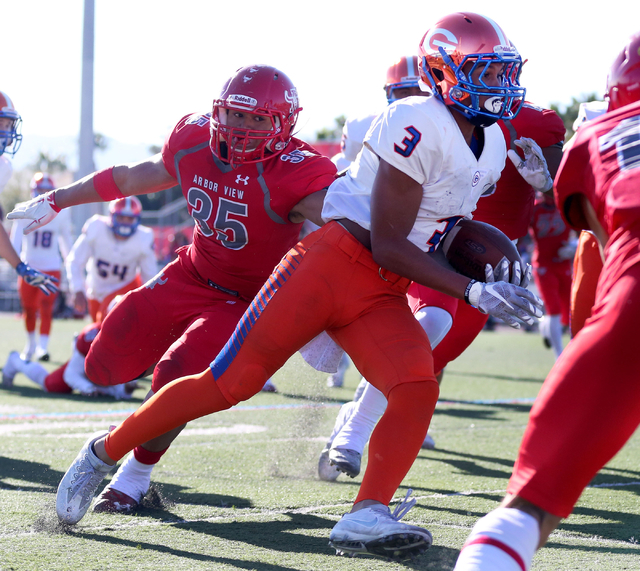 Bishop Gorman’s Jalen Nailor comes in at No. 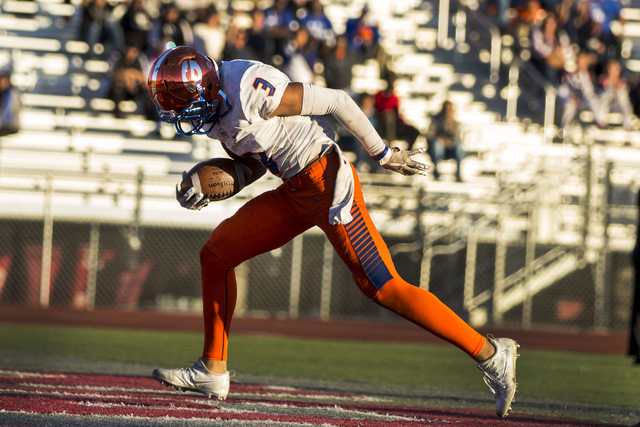 2 on our #NVprepsfb list of Southern Nevada’s top wide receivers/pass catchers. This resulted in the #NVprepsfb wide receiver/pass catcher rankings. The list is based off high school productivity and not college or professional potential. Stay tuned for our defensive player list next week. Nailor, a consensus three-star recruit, has scholarship offers from Arizona, Arizona State, Colorado, Michigan State, UNLV, UNR, Utah, Washington State and Wisconsin among others. 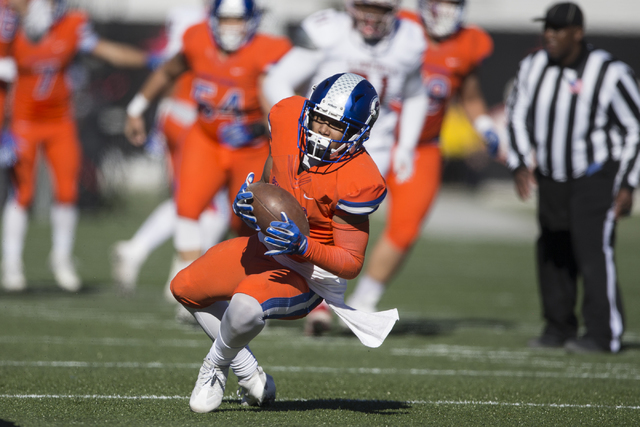 Nailor led a potent Gaels offense with 52 receptions, 929 yards and 14 touchdowns, and even rushed for a touchdown in helping Bishop Gorman go 15-0, win a league, region, state and national championship. Nailor will be catching passes this season from fellow 2016 wide receiver Dorian Thompson-Robinson, who is shifting to quarterback. — “Sometimes, when you’re on Gorman, you get lost in the shuffle. That was kind of the case last year, but this will be his year to step up and be the guy,” one Sunrise Region football coach said. — “The way he runs his routes and he comes off his angles, and speed steps and gets out of his breaks makes up for the speed, or lake thereof, that he would get in the 40, just running straight ahead,” one Sunset Region football coach said. Kothe, a three-star recruit on Scout.com, committed to San Diego State on July 5. He chose the Aztecs over scholarship offers from Air Force, Colorado, UNLV and others. Kothe finished with 55 receptions, 1,053 yards and 10 touchdowns for the Crusaders last season. 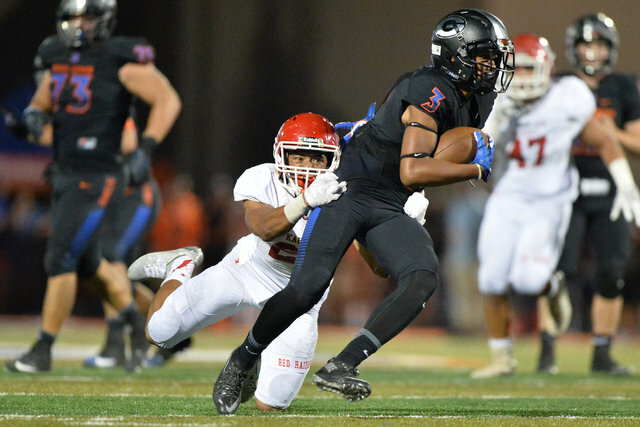 In a Class 4A Sunset Region second-round playoff game against Bishop Gorman, he caught five passes for 120 yards facing a secondary that featured seniors Bubba Bolden (Southern California), Greg Francis (UNLV) and Alex Perry (Arizona State). Kothe will get another year with quarterback Sagan Gronauer, who came in at No. 5 on the Nevada Preps list of top returning quarterbacks, and will look to build on the team’s 6-5 record and first-round playoff victory last season. Mitchell, a consensus three-star recruit, committed to Arizona on April 28. He chose the Wildcats over scholarship offers from Hawaii and UNLV. Mitchell played all over the field for Desert Oasis during the 2016-17 season, racking up 110 passing yards, 283 rushing yards and 262 receiving yards. He scored four of the Diamondbacks’ 12 touchdowns on the season. 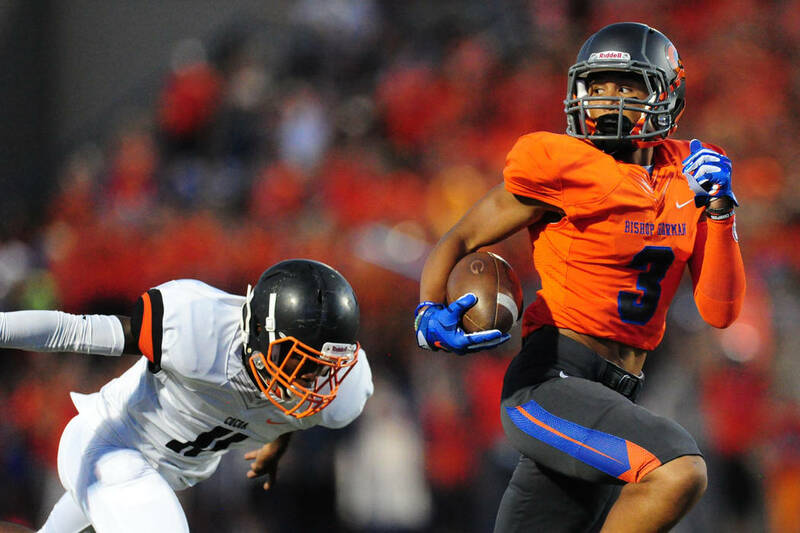 Mitchell, who is working on becoming eligible after moving across town, will benefit from joining Desert Pines — last year’s Class 3A state champion — and focusing solely on the wide receiver position. — “He’s a kid you’re not going to get a very good read on because he played at (Desert Oasis) last year,” one Sunrise Region fooball coach said. Powell has one scholarship offer from Hawaii. In his first year with the Patriots, Powell caught 41 passes for 538 yards and seven touchdowns behind all-state receivers Darion Acohido and Ethan Dedeaux. He excelled as a sophomore at Green Valley in 2015, leading the team in receptions (46), receiving yards (593) and touchdowns (8). Look for him to be a top target for Liberty quarterback Kenyon Oblad in 2017.